The rotational speed of a planetary body around its own axis is primarily set by the angular momentum the mass of matter making up the body had when it first coalesced into a planet. What determined that initial angular momentum is unknown. All known effects thereafter (mainly tidal and all fundamentally gravitational effects) slow this rotation. For the last 3,000 years the earth’s rotation has been slowing down to cause the day to lengthen by about 2 milliseconds per century. Currently the solar (siderial) day has a mean value of about 2 milliseconds greater than 86,400 seconds while the stellar day (relative to the fixed stars) has a mean value of about 86, 164 seconds. We have no real explanation for why Mercury and Venus rotate as slowly as they do. But it is believed that at coalescence the angular momentum must have been similar but subsequent gravitational effects (solar gravitation effects on Mercury and “tidal” effects on Venus and it’s thick atmosphere) have drastically slowed the rotation. But this is mainly speculation. It is now thought that even distant Jupiter may be having an effect on Mercury’s orbit and spin. Mercury spins three times on its axis for every two revolutions around the sun. It was natural to assume the sun was influencing Mercury’s spin. Now scientists have learned that distant Jupiter – largest planet and second-largest body in our solar system – also may also be influencing Mercury’s orbit and spin, which is more complex than scientists realized. 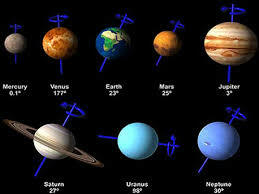 Among the outer planets there is a very rough correlation between the size of the planet and rotational speed. But there are no apparent correlations with mass, density, distance from the sun or any other parameter. All we can say about any planet’s spin is that it depends on the angular momentum of the material which coalesced to form the planet and thereafter it changed due to collisions as the planet formed, subsequent gravitational interactions with other bodies, and tidal interactions. The laws of physics (as we know them) did not apply at the Big Bang singularity. All the energy (dark, imaginary and real) in the universe and all the momentum in all the materia (dark or otherwise) making up the universe was determined in the singularity when the laws of physics did not apply. How the Big Bang caused matter to gain spin in the first place is also unknown. 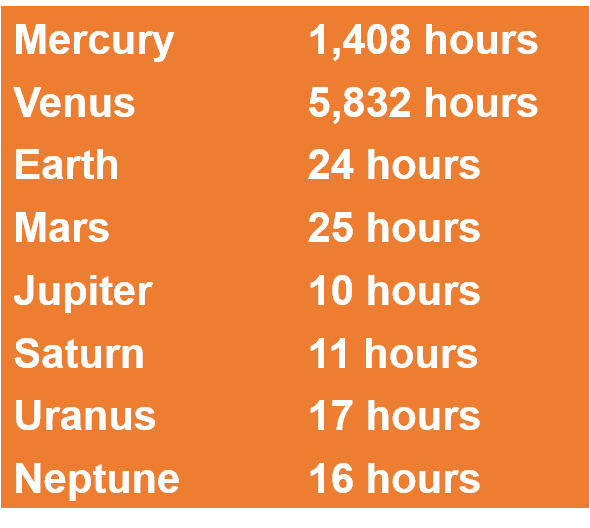 So the simple answer to why earth’s day is 24 hours long (and why any planet’s rotational speed is what it is) is that we haven’t a clue. This entry was posted on June 26, 2017 at 8:49 am and is filed under Astronomy, Physics. You can follow any responses to this entry through the RSS 2.0 feed. Both comments and pings are currently closed. …as long as you are using ‘magic’ to denote as yet unknown science! Being unknown it is also in the space of ignorance like any other God or Magic.